30 min before first show time you can add your name to the Stand-By list at WILL CALL for people waiting to see if anyone turns in tickets they can't use. CLICK HERE to view the PDF of girls dressing room assignments for Shows #2-5. Quick Change Dressing Room is the one through the lobby close to backstage. Main Girls Dressing Room is a room in the community center building to the left before you enter the theater lobby. The actual room used may change from day-to-day but will be labeled. All boys from any class will be in the Boys Dressing Room behind the stage area. We can't put on a show without volunteers. Volunteering not required, but sure appreciated!! VOLUNTEERS check in at the Volunteer Check-In Table and get a description of your role. It is in the lobby next to gear separated from WILL CALL now. Linda and Justin will be around if you have any questions. You will an e-mail with instructions as well. STEP UP THE HAIR AND MAKE-UP GAME FROM REHEARSAL!!! DRESSING ROOM ASSIGNMENTS are posted on Inside Scoop, Outside Each Dressing Room and at the Lobby Entrance. The BOYS dressing room will be open which is backstage and there is signage for everything. CHECK YOUR DANCER IN at their dressing room for the day (door volunteers have check-in sheets). DANCERS REMAIN BACKSTAGE during shows (in dressing room or waiting in halls) and there will be a head count between shows. VOLUNTEERS WILL BE AT EACH DRESSING ROOM and younger classes have volunteers dedicated to just their classes. VOLUNTEERS ONLY BACKSTAGE - Volunteers sign in near the Ticket table and Gear Table get a name badge. No name badge, no backstage! Extra helpers in Main Dressing Rooms are allowed if non-disruptive. Please be on time to receive instructions from the Volunteer Check-In. BE SMART WITH FOOD avoid eating in costume (button-up cover shirts are awesome). Please don't leave food sitting open in dressing rooms to spill on other people's costumes! Justin was picking up trash after Show #1! Sad face. NO INS & OUTS during the show if you have a seat. Simply enjoy the show and let the volunteers handle the backstage magic. DANCERS, DON'T FORGET TO LABEL EVERY COSTUME PIECE, SHOE AND WATER BOTTLE IF BRINGING ONE. $25 per DVD (Each "Show" is a different DVD). $3 shipping per order direct to you within 4-6 weeks after the show!! 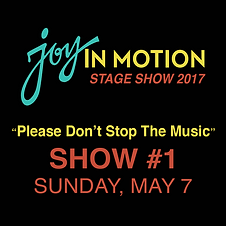 CLICK HERE to view the PDF (UPDATED 4/16/17) that says when your family is performing. Please let us know ASAP if we have an error for your family. Program will be printed based on these show commitments. Rehearsal call times and show orders by class are found below on this Inside Scoop page.